Boone is a town located in the Blue Ridge Mountains of western North Carolina, United States. Boone's population was 17,122 in 2010. Boone is the county seat of Watauga County and the home of Appalachian State University. The town is named for famous American pioneer and explorer Daniel Boone, and every summer since 1952 has hosted an outdoor amphitheatre drama, Horn in the West, portraying the British settlement of the area during the American Revolutionary War and featuring the contributions of its namesake. Boone took its name from the famous pioneer and explorer Daniel Boone, who on several occasions camped at a site generally agreed to be within the present city limits. Daniel's nephews, Jesse and Jonathan (sons of brother Israel Boone), were members of the town's first church, Three Forks Baptist, still in existence today. Boone is the home of Appalachian State University, a constituent member of the University of North Carolina. Appalachian State is the sixth largest university in the seventeen-campus system. Caldwell Community College & Technical Institute also operates a satellite campus in Boone. Boone is a center for bluegrass musicians and Appalachian storytellers. 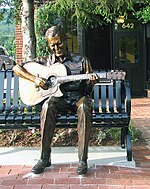 Notable artists associated with Boone include the late, Grammy Award-winning bluegrass guitar player Doc Watson and the late guitarist Michael Houser, founding member of and lead guitarist for the band Widespread Panic, both Boone natives, as well as Old Crow Medicine Show, The Blue Rags, and Eric Church. The Blair Farm, Daniel Boone Hotel, Jones House, John Smith Miller House, and US Post Office-Boone are listed on the National Register of Historic Places. Boone is located at 36°12′41″N 81°40′7″W﻿ / ﻿36.21139, -81.66861 (36.211364, −81.668657) and has an elevation of 3,333 feet (1015.9 m) above sea level. An earlier survey gave the elevation as 3,332 ft and since then it has been published as having an elevation of 3,333 ft (1,016 m). Boone has the highest elevation of any town of its size (over 10,000 population) east of the Mississippi River. As such, Boone features, depending on the isotherm used, a subtropical highland climate (Köppen Cfb), or a humid continental climate (Köppen Dfb), a rarity for the Southeastern United States, and straddles the boundary between USDA Plant Hardiness Zones 6B and 7A; the elevation also results in enhanced precipitation, with 52.7 inches (1,340 mm) of average annual precipitation. Compared to the lower elevations of the Carolinas, winters are long and cold, with frequent sleet and snowfall. The daily average temperature in January is 31.2 °F (−0.4 °C), which gives Boone a winter climate more similar to coastal southern New England rather than the Southeast, where a humid subtropical climate dominates. Blizzard-like conditions are not unusual during many winters. Summers are warm, but far cooler and less humid than lower regions to the south and east, with a July daily average temperature of 68.5 °F (20.3 °C). Boone typically receives on average nearly 35 inches (89 cm) of snowfall annually, far higher than the lowland areas in the rest of North Carolina. As of the census of 2000, there were 13,472 people, 4,374 households, and 1,237 families residing in the town. The population density was 2,307.0 people per square mile (890.7/km²). There were 4,748 housing units at an average density of 813.0 per square mile (313.9/km²). The racial makeup of the town was 93.98% White, 3.42% Black or African American, 0.30% Native American, 1.19% Asian, 0.05% Pacific Islander, 0.46% from other races, and 0.60% from two or more races. 1.64% of the population were Hispanic or Latino of any race. There were 4,374 households out of which 9.6% had children under the age of 18 living with them, 21.0% were married couples living together, 5.6% had a female householder with no husband present, and 71.7% were non-families. 38.4% of all households were made up of individuals and 7.3% had someone living alone who was 65 years of age or older. The average household size was 1.97 and the average family size was 2.63. The age distribution is 5.8% under 18, 65.9% from 18 to 24, 12.1% from 25 to 44, 9.1% from 45 to 64, and 7.1% who were 65 or older. The median age was 21 years. Both the overall age distribution and the median age are driven by the presence of the local university, Appalachian State. For every 100 females there are 95.6 males. For every 100 females age 18 and over, there were 94.7 males. The median household income is $20,541, and the median family income is $49,762. The per capita income is $12,256. 37.0% of the population and 9.2% of families were below the poverty line. Men had a median income of $28,060 versus $20,000 for women. However, poverty statistics that are based on surveys of the entire population can be extremely misleading in communities dominated by students, such as Boone. Out of the total population, 6.3% of those under the age of 18 and 9.1% of those 65 and older were living below the poverty line. The Mountain Times (free weekly entertainment publication). The High Country Press (daily online news publication). A smaller newspaper, The Appalachian, is Appalachian State University's campus newspaper published twice a week on Tuesdays and Thursdays. In addition to the locally printed papers, a monthly entertainment pamphlet named Kraut Creek Revival has limited circulation and is funded by a Denver, NC-based newspaper. WATA-AM 1450 AM is predominantly News Talk. WZJS-FM 100.7 FM is an Oldies radio station. WMMY-FM 106.1 FM is a Country Music radio station. WWMY 102.3 FM is an Adult Contemporary radio station, mostly music, also University of North Carolina Tar Heels sports network, and Carolina Panthers football. WECR 1130 AM is primarily a Gospel Music and Local News station. WXIT-AM 1200 AM is predominantly Conservative Talk Radio. WASU 90.5 FM is a college radio station run from the Appalachian State University campus. WNCW 92.9 FM NPR Affiliate a noncommercial public radio station licensed to Isothermal Community College. Boone operates under a mayor-council government. The city council consists of five members. The mayor presides over the council and casts a vote on issues only in the event of a tie. As of July 2015, the Town Council members are: Rennie Brantz, Acting Mayor and Mayor Pro Tem, and Councilors: Lynne Mason, Fred Hay, and Quint David. 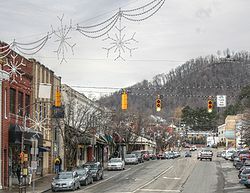 Industrial, commercial, and residential development in the town of Boone is a controversial issue due to its location in the mountains of Appalachia. On October 16, 2009, the town council accepted the "Boone 2030 Land Use Plan." While the document itself is not in any way actual law, it is used by the town council, board of adjustment, and other committees to guide decision making as to what types of development are appropriate. In 2009, the North Carolina Department of Transportation began widening 1.1 miles of U.S. 421 (King Street) to a 4-to-6-lane divided highway with a raised concrete median from U.S. 321 (Hardin Street) to east of N.C. 194 (Jefferson Road), including a new entrance and exit to the new Watauga High School, at a cost of $16.2 million. The widening has displaced 25 businesses and 63 residences east of historic downtown King Street. The project was slated to be completed by December 31, 2011, but construction continued into the spring of 2012. Samaritan's Purse is based in Boone. ^ a b c d e f g "American FactFinder". United States Census Bureau. Archived from the original on 2013-09-11. https://web.archive.org/web/20130911234518/http://factfinder2.census.gov. Retrieved 2008-01-31. ^ "Philosophy of Ministry". http://3forksbaptist.org/about-us-pd-6.php. Retrieved 13 January 2017. ^ Arthur, John Preston (1915). A History of Watauga County, North Carolina. Richmond: Everett Waddey Co.. p. 30. https://archive.org/stream/historyofwataug00arth#page/30/mode/2up. Retrieved 13 January 2017. ^ a b c "NOWData - NOAA Online Weather Data". National Oceanic and Atmospheric Administration. http://www.nws.noaa.gov/climate/xmacis.php?wfo=rnk. Retrieved December 4, 2012. ^ "WFDD in the High Country on 100.1". WFDD.org. http://wfdd.org/wfdd-high-country-1001. Retrieved Oct 19, 2015. ^ "Boone2030Blogspot". TownOfBoone. http://boone2030.blogspot.com/. Retrieved 2010-10-31. ^ "Boone 2030 Land Use Plan PDF". Lawrence Group. http://www.thelawrencegroup.com/boone2030/finalDocs/BooneReportFinalBook110609.pdf. Retrieved 2010-10-31. ^ "NC DOT US421 Widening Project". NCDOT. http://www.ncdot.gov/projects/us421widening/. Retrieved 2010-10-31. ^ "statedotpaves". Wataugademocrat.com. 2007-03-16. http://www.wataugademocrat.com/2007/0312web/statedotpaves.php. Retrieved 2009-08-09. Wikivoyage has a travel guide for Boone (North Carolina). This page uses content from the English language Wikipedia. The original content was at Boone, North Carolina. The list of authors can be seen in the page history. As with this Familypedia wiki, the content of Wikipedia is available under the Creative Commons License.